Our patients often ask us excellent questions about dental care. When they do, we are inspired to share the answers with others who may be seeking the same clarification and understanding about options for their smiles. Our blog provides this opportunity. We hope you will find the information interesting and helpful as you learn more about the personal patient focus and conservative approach of our preventive, restorative, and cosmetic dentistry at Snow Dental Care. In a previous post “Smile Design (Part 1)”, I presented the concept of “Smile Design”, and in the last post “Smile Design (Part 2)” I illustrated a few examples of some of the principles I always evaluate in assessing a smile and considering enhancements that can be made. Studying cosmetic dental principles over two decades ago was somewhat frustrating. I found that most lectures, articles, and presentations described recognition and diagnosis (similar to “Smile Design (Part 2)”—not design. Knowing a list of principles is one thing. Developing a plan that keeps them all simultaneously balanced in harmony is quite another. In 1995, I developed a planning technique to solve this problem. 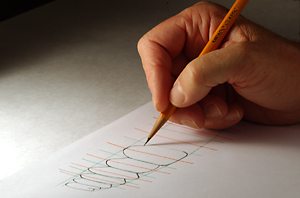 By drawing on superimposed pieces of tracing paper, the existing dental appearance could be compared to an ideal arrangement to determine not only what alterations are required but also what procedures would be needed to create it. 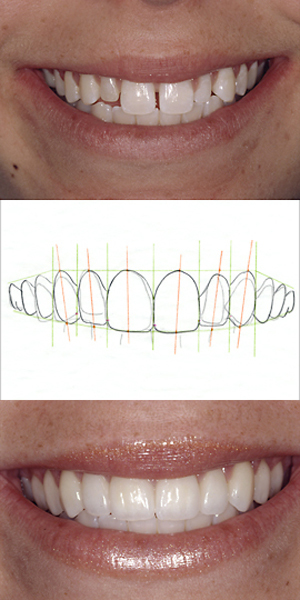 Just as an architect’s blueprint design is crucial to envision and then create a building, the Smile Design drawing technique is indispensable to plan and then create an exquisite smile. It has been a privilege and honor to teach dentists all across America how to perform this technique for the last 17 years. To see additional smile design results achieved on actual patients at Snow Dental Care, be sure to check out the beautiful smiles in our Smile Showcase . In the previous post “Smile Design (Part 1)”, I introduced the concept of “Smile Design”—purposefully planning, selecting, and coordinating dental procedures in order to craft specific desired esthetic results. Without this intentional discipline, arbitrary cosmetic dental treatment might not meet your expected goals. Who is to say what a “perfect” smile actually is? While it may seem pretty subjective, there is no question that as a society we notice how others respond to what they see. We can’t help but learn what is more accepted, popular, and attractive. Although “beauty is in the eye of the beholder”, eventually we form a predictable consensus of what beautiful is—even for smiles. After comparing and analyzing smiles that virtually everyone agrees are dazzling, dentists have noticed a common list of features that repeatedly contributed to create esthetic impact. Let’s take a look at a few of them. Other than gazing in the mirror, you’re probably not accustomed to staring close up at anyone’s smile except our own. If you take a moment to check out the smile at the right, however, you’ll notice several essential principles of Smile Design. For example, the imaginary line that connects the edges and tips of the upper teeth forms a gentle curve that generally follows the arc of the lower lip. The lateral incisors (right next to the two central teeth) are just a little shorter—a sign of a “youthful” smile. The “esthetic zone” within the lips is filled mostly with the pleasant appearance of teeth. The visible gum tissue is limited to the small tips between the teeth. We often use lip retractors to get a better analytic view of the teeth. In this retracted view (of the same person), we notice many foundations of good Smile Design. First and foremost, there is a pleasing symmetry in the contour, color and alignment of the teeth. They complement each other as a matching set. The sweep of the gumline around each tooth combines to establish an ideal frame for the arch. The width vs. height proportions of each tooth are pleasing and balanced—so that the two upper central teeth are subtly and slightly more prominent. These are just a handful of the dozens of features I look for when I evaluate the appearance of a smile. Once you understand and recognize the Smile Design components in a great looking smile, it is easy to see when they are missing. For comparison, let’s look at identical views for a different individual. The front smile reveals that the imaginary line that connects the upper teeth is irregular and leans down on the right side of the photograph. A continuous band of gum tissue is readily visible. 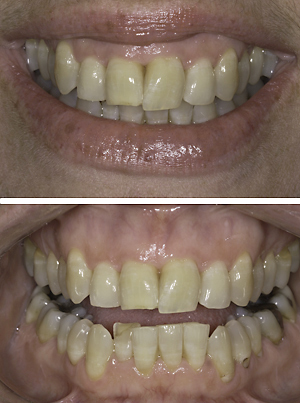 Beyond gumline decay, failing fillings and severe tooth wear, the retracted view (of the same person) exposes asymmetry, darker tooth coloration, and crowded alignment. The irregular frame of gum tissue accentuates the haphazard proportions of the teeth—as though they are not a matching set at all. 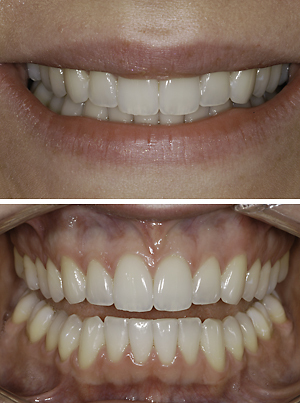 So how does Smile Design utilized to transform a smile from “unattractive” to “stunning”? Join me in our next post, “Smile Design (Part 3)”, to find out.